V&V Paint and Body has been helping vehicle owners get back on the road after an accident since 1971. We offer comprehensive collision repair, specializing in structural and nonstructural aluminum repair. Plus, we offer auto painting services to restore everything to perfection! Contact us after your accident and let us show you why we’re the most trusted paint and body shop in the area. When you’re in an auto accident, you want to put it behind you as quickly as you can. Unfortunately, every day you have to look at a damaged frame or scraped paint is another reminder of the incident. At V&V Paint and Body, we know this can be traumatizing. 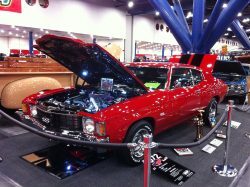 We offer the complete auto body repair in Houston, TX you need to get past your recent accident, with no reminders to haunt you. Our team is well-trained in restoring damage and will deliver your car back to you looking brand-new! We’re a PPG Certified Collision Repair Center and all of our staff members are I-Car Gold Certified, benchmarking our excellence. 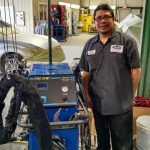 Our approach to collision repair in Houston, TX is simple: do the best job possible, as quickly as possible, with prices that are fair and honest to our customers. We understand that the people we’re helping are our friends, family members and neighbors—they’re people who live and work in our local community. That’s why we strive to give back. From our 24/7 towing to rental car assistance and beyond, you can count on us to help you through the collision repair process in any way we can. We even work with insurance to expedite the claims and repair process! If you’ve been in an accident and need auto repairs and paint, we invite you to contact us yourself and see why we’re the most trusted shop in the area. We’re PPG and I-Car Gold Certified, ensuring you’re getting the best, most reliable services. We offer 24-hour towing services when you need them most. We have wreckers and flatbed trucks at our disposal. We’re proud to work with Progressive Insurance in the, “Keys to Progress” Program, which supports veterans. Our business works extensively with 3 major dealerships in the area: Honda of Clear Lake, Subaru of Clear Lake and Clear Lake Infiniti. We offer a lifetime guarantee on our work and can work with any major insurance company to help expedite the process for you. Get in touch with us after your accident to learn how we can erase the damage and restore the splendor of your vehicle. We work with any insurance company to complete work quickly! We strive for perfection here at V&V. Here are some photos of our tech using our new Pro Spot, squeeze type resistance spot welder on an Infiniti. This machine can duplicate any OEM spot weld. We also have a new aluminum station for new vehicles!